Mr. Stevenson is an ex-FBI agent. When his daughter Jennifer is taken by the mob boss King Dom, he must cross the city and country, gathering the Black Panther Diamonds to trade for her life. 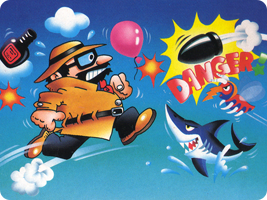 Use the NES Zapper to make Mr. Stevenson jump, as well as to take out the many obstacles in his path. Can you cross the perilous roads and rescue Jennifer?